Educational Philosophy - Charged Particles: Jazz with a Spark! Being an artist means a commitment to lifelong learning. Art is nothing if it is not innovative, and to be innovative means to see and do things in new ways. To energize one's perspective in a way that is constantly evolving and responding to the changing world, one must be absorbing -taking in events, people, places, objects, transitions, and more. Since its inception, Charged Particles has been committed to learning, and the group members have indeed come a long way in the last five years. We have learned about jazz as an idiom and about musical performance as a form of personal expression. We have learned about ourselves and each other as people and as instrumentalists, and we have learned about managing a cooperative enterprise involving three people with three compatible yet different perspectives and visions of the future. We have learned about other jazz artists on the international scene, the business of music, and our place in it. Our principal motivation for teaching is to share with others what we have been fortunate to learn in our travels thus far. As popular as jazz is around the country, it accounts for less than 5% of the gross revenues from sales of recorded music and from live performances. And although many people are familiar with one or two styles of jazz, most people have had little or no exposure to the full gamut of styles that make up the rich tradition of jazz. Surprisingly, most Americans are more familiar with traditional forms of jazz that date back 60 years than they are with contemporary approaches being forged today. And the links between the traditional roots of jazz and contemporary approaches are even less well-understood. When we teach students of all ages, we attempt first and foremost to expose listeners to the many different styles of jazz and to trace their historical development. And we present these styles not only as whole "gestalts", but also broken down into their rhythmic, harmonic, and melodic components. Music is about the expression of moods and emotions, and we explain how this is done in the many different sorts of pieces that compose our repertoire. We also explain to participants the personal backgrounds of the group members, tracing our movement from young students of music, through structured educational institutions, out into the professional world of the working performer. We explain how our group was formed, its philosophy, and how we evolve our collective musical vision as we progress from stage to stage. We touch on the forces at work in the business of music, and we have explained what we have learned about marketing a jazz group. We discuss the process of recording music in studios and working with record labels to attain distribution of recordings to the listening public. We explain how we compose pieces and how they are revised through the rehearsal and performance processes. And we explain and decompose the heart and essential defining element of jazz: improvisation. Although this listing of topics we cover might seem to suggest a one-way lecture/demonstration approach, it in fact is not. Rather, we engage from the very beginning of any presentation in a dialogue with students, asking questions and seeking reactions. In our experience, students are far more engaged when talked with, rather than when talked to. And when we work with musicians, we welcome them to participate in our presentation, by playing with us. And we enjoy listening to and commenting on performances by student soloists or ensembles, to share the perspectives we have gained and to help facilitate the process of maturation. Our current study is focused on three issues: one idiomatic and the others technical. On the idiomatic side, we are focused on development of our skills in playing the traditional acoustic jazz repertoire from the swing and bebop eras. On our recent tour to Los Angeles, we received a remarkably warm reception for our performances of jazz standards, and this reception has energized us to expand our repertoire in this area, to strengthen our skills in performing this music, and to expand the number of opportunities we have to play it. On the technical side, we have recently come to recognize more vividly than before that the drive and excitement of any piece of music comes importantly from the placement of notes in temporal space. The difference between a piece that truly swings and one than simply lopes along is especially in the steadiness and temporal placements of each musician's notes. We are therefore working at strengthening our individual senses of time and enhancing the precision of the temporal placement of our notes in relation to each other. Finally, we are at work expanding our command of the vocabulary of jazz. To speak a language means to have at one's fingertips a wide array of words that can be assembled into sentences and paragraphs. Similarly, improvisational jazz entails constructing a monologue drawn from a well-spring of phrases that have evolved throughout the history of the idiom. The more such phrases one has mastered, the more varied and engaging the musical monologue can be. Consequently, we are at work expanding our musical vocabularies through the study of the virtuosos who have come before us. 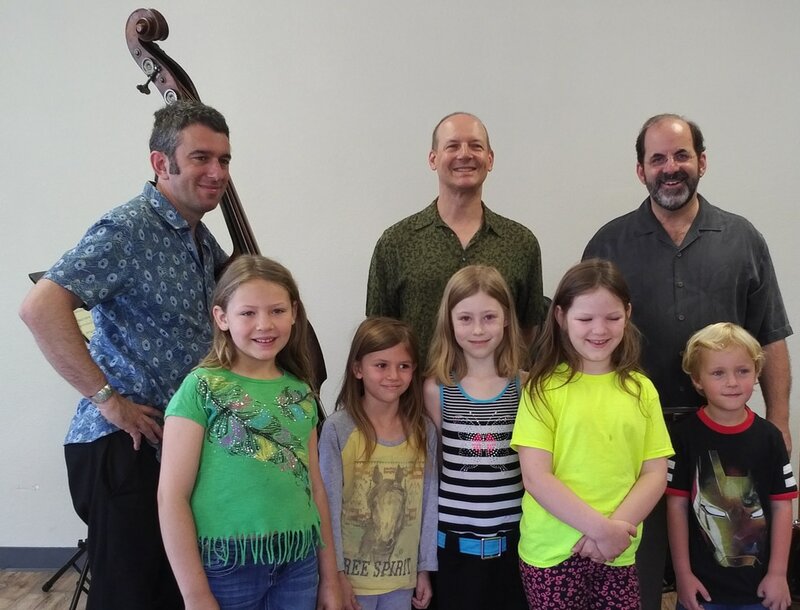 Charged Particles (featuring special guest keyboardist Greg Sankovich) with children after a performance in a Monterey County Library.